This turbo kit is universal. It is for customer custom make project, and perfect upgrade your car and get more boost. Your car will gain 130-180HP if you set at 7-15PSI. Customers require upgrade the fuel pump, injector and ECU to tune the car if you set at higher PSI. This kit can max up to 550HP. 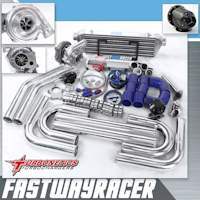 This turbo kit does not include turbo manifold and downpipe. It need to custom make by yourself or buy it from someone else. 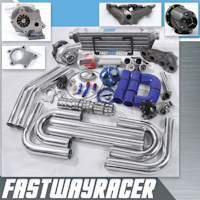 We offer 90 days warranty for this turbo kit if it is installed by ase certified mechanic! 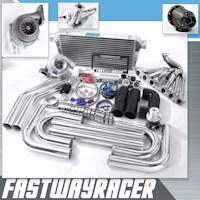 We also offer "FASTWAYRACER" license plate and "FASTWAYRACER" sticker for free! Brand new GT35 T4 .68AR turbo charger. Max up to 550HP. Downpipe Flange: 3.0 V-band Flange. Brand new 3.0'' v-band clamp. It is made of high quality stainless steel. Package includes: one clamp, two flanges. For two v-band flange connect without welding or bolts, locking nut will prevent back out. 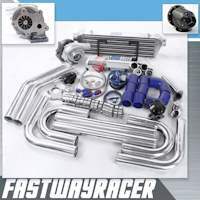 Brand new universal 3.0'' polished aluminum piping kit. It is made of high quality T6061 aluminum. This piping kit is universal, it is not bolt on type. Customers need to cut and bent the intercooler pipe to fit your car. 3.0'' inlet diameter, increase more airflow. It comes with high quality 4PLY silicone couplers and strong and tighter t-bolt clamp. It can support up to 600HP. Brand new universal 30.5''x12''x3.0'' front mount intercooler. 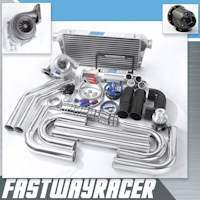 The intercooler is made of high quality T6061 aluminum. It is bar and plate design, high flow and light weight. It can support up to 600HP and 40PSI. Full size: 30.5''x 12''x 3.0''. Core size: 24''x 12''x 3.0''.